"It's just hard to lose somebody you really... you really love." Barry Winchell, a native of Kansas City, Mo., had been at Fort Campbell since May 1998. 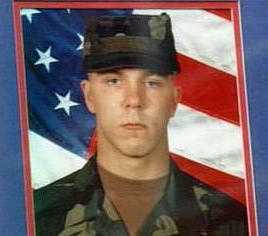 During the early morning hours of July 5th, 1999 at Fort Campbell, Kentucky, Private First Class Barry Winchell, 21, of 2nd battalion, 502nd Infantry Regiment, was bludgeoned to death, at 3 a.m., with a baseball bat by one or more fellow soldiers in his barrack hallway. Winchell died, about 9 a.m., at Vanderbilt University Medical Center in Nashville, Tennessee. Serious concerns have been raised that this murder may have been an antigay hate crime. Two soldiers have been charged in connection with the murder and are now in custody, charged with premeditated murder. It is reported that up to ten soldiers may have been involved in the incident. Soldiers and military supervisors told Army attorneys that Barry Winchell withstood taunting and physical abuse as rumors about his sexual orientation spread around the post. No one in the chain of command ordered their soldiers to stop the harassment. The Army conducted a hearing this week to determine whether the murder case against Pvt. Calvin Glover, 18, of Sulphur, Okla., will go to a general court-martial. If convicted, Glover could serve a life sentence. Prosecutors also may ask for the death penalty, Fort Campbell officials said. The outcome is similar to penalty options in a civilian court under the same circumstances. Winchell's roommate, Specialist Justin Fisher, 25, of Lincoln, Neb., is charged as an accomplice. Fisher was accused of encouraging Glover to hit Winchell, acting as an accessory after the crime, lying to investigators and obstructing the investigation. Two sergeants in Winchell's platoon testified that Winchell was the frequent target of name-callers because of rumors that he was gay. Both said Fisher started spreading the rumors. Fort Campbell officials have released few other details about the slaying and have instructed Winchell's fellow soldiers to not discuss it with reporters. Meanwhile, the Army on Tuesday, July 13, announced it has sent 225 of the soldiers assigned to the brigade where Winchell had been stationed to Saudi Arabia for six-month tour of duty. Gay activists are concerned that some of the soldiers sent to Saudi Arabia may have information that could be relevant to the investigation into Winchell's murder. Officials at Fort Campbell could not be reached for comment by Blade deadline to determine if any of the soldiers sent to Saudi Arabia are believed to have information pertaining to the murder. 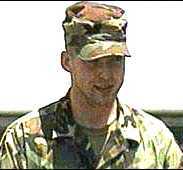 The soldier accused of killing Pfc. Barry Winchell is a boastful drunk who picks fights and once told acquaintances he hated blacks and "faggots," servicemen testified yesterday. A string of soldiers questioned at a Fort Campbell hearing said Winchell had bested Pvt. Calvin N. Glover in a fistfight the night of July 3. Some accounts indicated Glover may have been looking for revenge. Early July 5, Winchell was found beaten and unconscious in the hallway outside his barracks. The guys at the barracks drank heavily on Independence Day, Hoffman said. The party broke up around midnight. Winchell had volunteered to watch the area mascot that night, a high-strung Australian blue heeler named Nasty. To keep her company, Winchell pulled a cot out of his third-floor room onto the front walkway and slept outside, the men said. Pfc. Nikita Sanarov told investigators he awoke to banging on his barrack door at 3 a.m. July 5. Fisher stood outside saying, "Winchell is dying," and he asked if Sanarov could get his car to help him. Sanarov testified that as he brought his car around to the barracks, he saw Glover sprinting from one housing unit to another. He later saw Glover run from his barracks unit carrying a handful of clothes toward some Dumpsters, he said. Glover dropped some of the clothes in his hurry, Sanarov said. Several soldiers said they recalled Glover coming from the direction of the Dumpsters toward the scene as paramedics loaded Winchell into an ambulance. Glover was drenched in sweat or water, they said, and had stripped to a pair of shorts. Brown said investigators picked up a blood-stained glove on the ground near the Dumpsters. A crime lab still is processing the glove, a blood-smeared shirt and some socks found in Glover's room, and more than 60 other pieces of evidence collected at the scene, the attorneys said. At its unveiling, the military's 5-year-old "Don't Ask, Don't Tell, Don't Pursue" policy was heralded by politicians as a livable compromise for gays and lesbians in the service. In this investigation, though, people who come forward with information about Winchell's life could find their own sexual orientation questioned, gay rights activists said. That could lead to more problems, according to a March study published by the Service Members' Legal Defense Network. Their report said incidents of anti-gay harassment in the military more than doubled over the last year, jumping from 182 recorded in 1997 to 400 recorded in 1998. Instances ranged from verbal gay-bashing to death threats and violence, the report said. If Winchell had felt threatened before the incident, he could have talked to his superiors or the post's Equal Opportunity Office, Hart said. On a Web site maintained by the Legal Defense Network, though, a survival guide for gays in the military warns against reporting the incidents outright: "Currently, if gay service members reveal their sexual orientation or activities when reporting harassment, death threats or hate crimes, they risk investigation and discharge." The Service Members' Legal Defense Network was formed in 1993 after the "Don't Ask, Don't Tell, Don't Pursue" policy was created by the Clinton administration. The network was also an outgrowth of the 1992 death of Allen Schindler, a sailor who was murdered after telling his commanders in the Navy and others that he was gay. A 21-year-old sailor, Terry Helvey, pleaded guilty to the murder. "The military has a grave responsibility to come forward with the truth of this matter, said Jeffrey Montgomery, a Steering Committee member of NCAVP, and Executive Director of Michigan's glbt anti-violence program, The Triangle Foundation. "SLDN, and others, have clearly documented the failures of the "Don't Ask, Don't Tell, Don't Pursue" policy. With this incident, if true, we see that the policy is not only wrong, but it's dangerous."